1696: first recorded stage performance; he performs as a wakaonnagata under the name of Tamagawa Fujinosuke in Kyôto in the drama "Daizassho Ise no Oshiroi". 11th lunar month of 1698: Tamagawa Fujinosuke takes the name of Wakamura Sawanosuke in Ôsaka at Shioya Kurôemon's theater, playing the role of Danshichi's wife in the drama "Yadonashi Danshichi", which is produced by Kataoka Nizaemon I (who plays the role of Danshichi). 1st lunar month of 1704: Wakamura Sawanosuke takes the name of Wakamura Jûrozaemon. 11th lunar month of 1706: he becomes tachiyaku and takes the name of Wakamura Shôgorô in Ôsaka, performing in the kaomise drama "Ebisu Otoko Onna Daigoku Hashira Gatame", which is produced by Kataoka Nizaemon I. Fall 1709: he goes to Kyôto. 11th lunar month of 1709: he becomes katakiyaku and takes the name of Matsuura Gizaemon at Ebisuya Shôdayû's theater, performing in the kaomise drama "Yomeiri Ôkeizu". 11th lunar month of 1710: he becomes jitsuaku and takes the name of Miura Gizaemon in Kyôto at Ebisuya Shôdayû's theater, performing in the kaomise drama "Inari Chôja Yotsugimaru", which is produced by Yamashita Karumo. End of 1714: Miura Gizaemon takes the name of Kataoka Hikoshirô. 1st day of the 11th lunar month of 1715: his master Kataoka Nizaemon I dies. 11th lunar month of 1715: Kataoka Hikoshirô takes the name of Miogi Gizaemon. 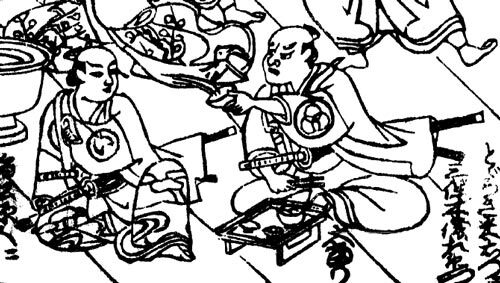 11th lunar month of 1716: Miogi Gizaemon takes the name of Mihogi Gizaemon I. Fall 1716: first Kabuki adaptation of Chikamatsu Monzaemon's masterpiece "Kokusen'ya Gassen", which is produced by the zamoto Sakakiyama Shirotarô I in Kyôto at Miyako Mandayû's theater; Gizaemon plays the role of Ritôten [casting]. 11th lunar month of 1717: Gizaemon plays in Kyôto the role of Tamagushi Kazuemon in Sadoshima Saburôzaemon's kaomise drama "Iwao no Matsu Manbai no Midori", which is produced by Miyako Mandayû in his theater. 11th lunar month of 1719: Mihogi Gizaemon I takes the name of Miura Gizaemon. Fall 1721: he goes back to Kyôto. 11th lunar month of 1721: Miura Gizaemon becomes tachiyaku and takes back the name of Mihogi Gizaemon I, performing in Kyôto in the kaomise drama "Yamato Uta Denju no Tomikura". 11th lunar month of 1722: Gizaemon plays in the kaomise drama "Ôbashira Kogane no Sazare Ishi", which is produced in Kyôto at Miyako Mandayû's theater by Segawa Kikunojô I. 1st lunar month of 1723: Gizaemon's rank in the Kyôto hyôbanki, tachiyaku section, is jô-jô-(hanshiro)kichi (superior - superior - almost excellent). He shares the same rank with Sakakiyama Koshirô I. 11th lunar month of 1723: Gizaemon plays the role of Matsugane Kambei in the kaomise drama "Manchô Chitose-gura", which is produced by Arashi Sanjûrô I for the nadai Ebisuya Kichirôbê. 1st lunar month of 1724: Gizaemon's rank in the Kyôto hyôbanki, tachiyaku section, is jô-jô-kichi (superior - superior - excellent). He shares the same rank with Osagawa Jûemon, Takeshima Kôzaemon II and Anegawa Shinshirô I. 11th lunar month of 1724: Gizaemon becomes zamoto in Kyôto, producing at Hayagumo Chôdayû's theater the kaomise drama "Sanmen Daikoku Mangoku Dawara", which stars Bandô Hikosaburô I, Arashi Sangorô I, Katayama Kozaemon, Somenoi Hanshirô, Matsumoto Tomojûrô I, Matsunami Hikojûrô, Fujikawa Heikurô, Sodeshima Genji, Tsugawa Kamon, Yamamura Utanosuke, Kirinami Onoe and Onoe Gonbê (who celebrates his shûmei). 11th lunar month of 1728: he becomes jitsuaku and plays the role of Suruga Jirô in the kaomise drama "Mandai Toshigoyomi". 1st lunar month of 1729: Gizaemon's rank in the Kyôto hyôbanki, jitsuaku section, is jô-jô-kichi (superior - superior - excellent). He shares the same rank with Ichikawa Sôzaburô I and Yashio Ikuemon. Summer 1731: tour in Nagoya. 11th lunar month of 1731: Gizaemon plays in Kyôto at Hayagumo Chôdayû's theater the role of Todoroki Yoneemon in Sawamura Bunji's kaomise drama "Asahi no Ichikura Eigô Seki". 11th lunar month of 1734: Gizaemon plays the role of Yaegaki Hyôgonosuke in the kaomise drama "Oyayuzuri Kogane no Katokugura", which is produced at Kameya Kumenojô's theater by Sakakiyama Shirotarô I. 11th lunar month of 1738: Gizaemon plays in the kaomise drama "Neko no Koneko", which is produced at Hoteiya Umenojô's theater (Minamigawa no Shibai) by Mizuki Tatsunosuke II. 11th lunar month of 1739: Gizaemon plays at Ebisuya Kichirôbê's theater in the kaomise drama "Senzai Yakata Kogane no Shikigawara", which is produced by Arashi Koroku I. 5th lunar month of 1742: Chikamatsu Monzaemon's play "Shinshû Kawanakajima Kassen" is adapted for Kabuki for the first time, in Kyôto at the Kitagawa no Shibai; Gizaemon plays the role of Takeda Shingen [more details]. 11th lunar month of 1742: Gizaemon plays at the Kado no Shibai the role of Shinoda's karô Matsugane Sagoemon in the kaomise drama "Sangoku Denrai no Ishi", which is produced by Iwai Hanshirô III; his stage partners are Mimasu Daigorô I, Segawa Kikujirô I, Ichiyama Sukegorô I, Somenoi Hanshirô and Yamashita Kinsaku I. 11th lunar month of 1744: Gizaemon plays in Kyôto at Miyako Mandayû's theater the role of Kikuchi Heimanosuke in the kaomise drama "Hakata Ori Imose no Karanishiki"; his stage partners are Fujioka Daikichi, Tamiya Shirogorô, Sawamura Chôshirô, Sadoshima Chôgorô I, Matsumoto Tomojûrô I, Nakamura Danzô, Tatsuoka Hisagiku, Sanogawa Hanazuma II, Sakakiyama Danshirô I, Takenaka Hyôkichi, Ikushima Kashiwagi I, Nakamura Matsubê I, Nakamura Kiyosaburô I and Fujioka Gengorô. 2nd lunar month of 1745: Gizaemon appears on stage for the last time, in Kyôto at Miyako Mandayû's theater, playing two roles in the new year drama "Keisei Sakura Gassen". He most likely dies in 1745. Mihogi Gizaemon I was a major 18th century Kyôto actor, who acted as tachiyaku and a jitsuaku. He reached the jô-jô-kichi in 1724 and kept it for more than 20 years. He became definitively jitsuaku in 1728 and excelled in roles of evil samurai/karô up to the end of his career in 1745.